A traditional satay sauce is quite thick, but for this dish John loosens it with coconut milk to make a more liquid sauce for the chicken balls and noodles. My other half, John, is a chef and an Aussie. Ever since he came back from working in Malaysia and made this dish for Billie and me I have been pestering him for this Chicken Satay recipe. 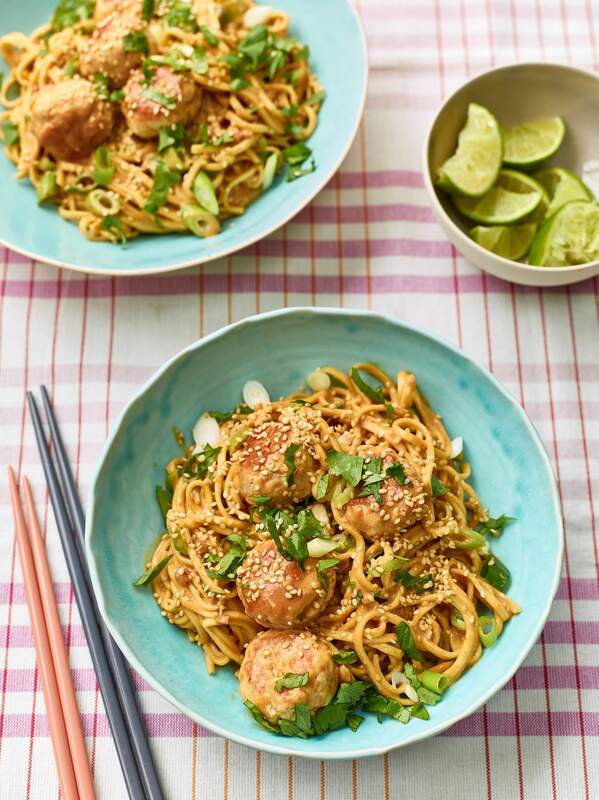 A traditional satay sauce is quite thick, but for this dish John loosens it with coconut milk to make a more liquid sauce for the chicken balls and noodles. I don’t think you will ever want to buy a jar of ready-made satay sauce again, but for those among you who have no time but want to make the balls and noodles, you can cheat and use shop-bought sauce and then loosen it with coconut milk, I won’t tell! If your children are reluctant to try spice, satay is a great way to introduce them to it gently. There’s only a mild hit of chilli, and most kids just love the sweetness of the peanut butter mixed with the coconut milk – which is seriously moreish – so they don’t even notice there’s a bit of kick behind them. Without shaking the tin of coconut milk, open and scoop the solid layer of cream from the top into a pan. Add the curry paste and cook over a medium–high heat until the sauce splits. Add the peanut butter and soy sauce and a third of the remaining coconut milk, mix together then bring to the boil and bubble away until thickened. Keep the sauce warm over a low heat while you make the chicken balls. Add a heaped tablespoon of this sauce to the minced chicken, stir to combine, and shape into balls – about the size of a ping pong ball. Heat a frying pan and brown the chicken balls all over, then add them to the sauce with the remaining coconut milk. Cook the noodles according to the packet instructions, then drain and add to the chicken balls and sauce. Toss everything together then serve scattered with the sesame seeds, spring onions, coriander and lime wedges to squeeze over.